Making social games is easy ! You'll also need to convert the private key used to generate this certificate to the .pem format. To do this, you first need to export your private key to p12 format by using the Keychain Access tool on your Mac. Launch Keychain Access and right click on the certificate that you have just downloaded and installed, and select the "Export" option, and then the .p12 format. 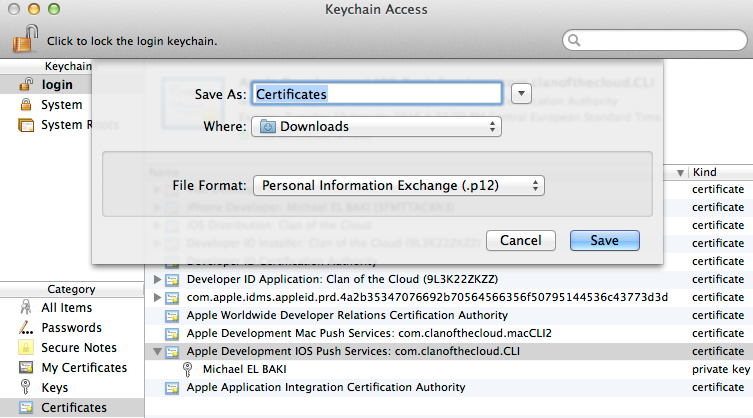 Once you've got your two .pem files, open a web page to your Back Office web page, tick the iOS box inside the the "Push Notification Certificates" in your Status page, and fill respectively the "Certificate" and "Private Key" cells with the contents of the files you just created at the previous step (see above). In case you need some more information about how Google Cloud Messaging works, please have a look at the official Google documentation. Otherwise, by following the steps below, you should be able to have your application manage push notifications pretty quickly. First, you need to setup a Google Application. The necessary steps to do this are explained in details in the Google+ section. Once this is done, this Google Application needs to reference the Google Cloud Messaging for Android API. This is done from the APIs section of the Google Developer Console for your project. Next step is to create a Public API key. To do so, select the Credentials section, just below the APIs section in the previous step, scroll down to the bottom of the page, and click the "Create new Key" button for the Public API access list of keys. Then select "Server key" option, and then "Create", not modifying anything. You should now have a new, valid API key. Once this is done, you're almost finished with parameterization, and only some bits of code will be needed. But first, you need to declare your Google Application with Clan of the Cloud through your Back Office web page. Now it's straightforward. Just tick the Android box inside the "Push Notification Certificates" in your Status page, and fill the "senderID" cell with the Google Application project number, and the "apiKey" cell with the key you just created at the previous step (see above). Now everything's been done on the Google Application side, we need to add a few snippets of code, so your application can communicate with the Google Cloud Messaging servers. First thing to modify is your AndroidManifest.xml, which needs a few new sections. Each time you see "com.yourcompany.yourapp", you need to replace that with the value of the package attribute from your manifest. 12 // you created the Google Application. 14 // This needs to be unique, so you can use your package name, and must end with GCM_RECEIVED_ACTION. 25 // to decorate the push notification. 32 // notification is presented on your device. That's it, you're done and can now begin to send push notifications to your Android application!